The GRIP-IT wears like a wallet...shoots like a gun! The GRIP-IT is the wallet that shoots back! The GRIP-IT can accommodate a variety of .380s, including those LCP's with the Crimson Trace and the S&W BodyGuard. The GRIP-IT hides the outline and keeps the pistol in draw position. The GRIP-IT shoots easily from the holster and the mag can be dropped & be replaced. Watch the training video shown below for more information on this unique carry method. HOW DOES THE GRIP-IT HOLSTER WORK? * The BEST explanation of how the GRIP-IT holster works can be found in our GRIP-IT TRAINING VIDEOS in the tab above. * The GRIP-IT holster gives you a much better grip on smaller bodied guns, and allows you to carry them safely in your pocket. * The gun shoots above the holster, not through it, and does not conceal the fact it’s a gun once it is drawn. * You can hold onto and shoot much better with the pistol in the GRIP-IT then you can without it. * The additional finger hole beneath the trigger gives you a better grip/shooting platform when firing, and the magazine release button is recessed so that the magazine will not come out when sitting with the holster in your pocket. * You can drop the magazine and reload the pistol without removing it from the GRIP-IT. * It is considered a modified grip, and therefore, it does not fall into the AOW category and complies with ATF regulations on wallet holsters. * Lifetime Factory Warranty for manufacturing defects and normal wear. WHAT GUNS DOES THE GRIP-IT HOLSTER FIT AND WHICH ONE DO I NEED? * The GRIP-IT can accommodate a variety of different .380s. 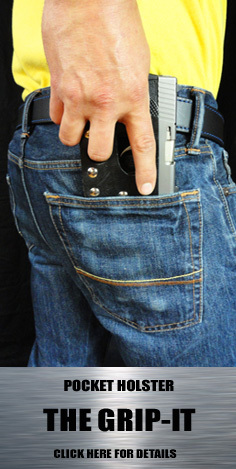 * The adjustment screws on the GRIP-IT holster, allow you to loosen and tighten the holster to fit your gun snuggly. * Check the chart below to see what type of GRIP-IT holster works with your gun. the Crimson Trace attachment. Additional brass button added to finger hole to activate trace. (See pictures above). Back to Main Holster Page!